My new paper with Sam Choi updates (through 2014:Q3) estimates of how much uncertainty has contributed to U.S. unemployment (particularly long-term unemployment) during the Great Recession. 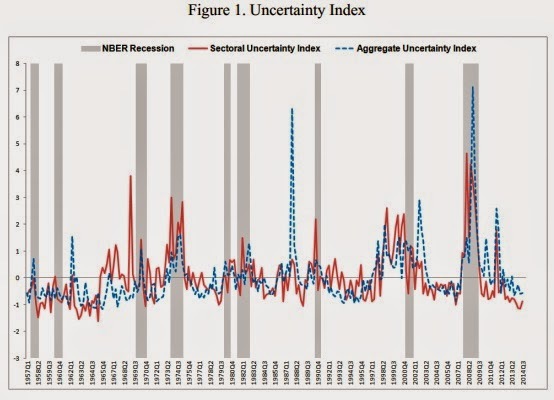 Our measures of aggregate and sectoral uncertainty are both back to pre-crisis levels. 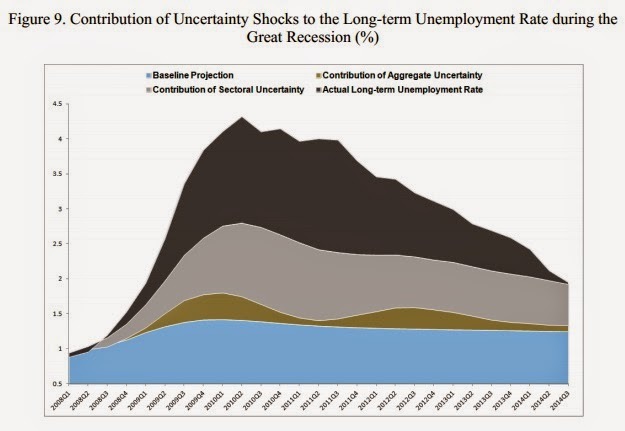 Consequently, the contribution to uncertainty to long-term unemployment has diminished considerably since 2010. Our aggregate uncertainty measure is the realized volatility of S&P 500 index returns, similar to Bloom (2009). We find that aggregate uncertainty contributed to long-term unemployment in 2009 and again in 2012. Our sectoral uncertainty measure is the cross-section dispersion in industry excess returns. We show in the paper that this measure of uncertainty tends to have more persistent impacts on unemployment than aggregate uncertainty. The contribution of sectoral uncertainty to U.S. long-term unemployment peaked in mid-2010 and has declined steadily ever since. The main reason for the decline in long-term unemployment form 4 percent in mid-2010 to 2 percent in 2014 is the resumption of growth (the contribution of growth is shown as part of the other factors in the chart above).